Recently, Steven Flanders wrote a nice blog post explaining what Webhook Shims are and how they can be used. In summary, both vRealize Log Insight and vRealize Operations support webhooks. This is a capability that allows for integration with any other solution that has a REST API available. Ticketing, notification, chat and other capabilities can be leveraged by vRealize Intelligent Operations. Extending that capability can make your datacenter a self-healing datacenter! If you are a user of vRealize Operations, you know that it can monitor your infrastructure, server OS, applications and more. But as you know, monitoring is only part of the answer. Wouldn’t it be much better to have vRealize Operations attempt some simple fixes before giving up and calling for human intervention? In this blog post series, I will explain how to activate automatically remediate a problem detected by vRealize Operations using the vRealize Orchestrator Webhook shim to launch workflow based on an alert. Currently, vRealize Operations alerting can trigger notifications via email, SNMP trap or REST notification. The REST notification plugin allows you to interact with REST APIs from practically any third-party system – almost! The truth is the REST Notification Plugin is not very robust and does not provide a lot of control over format of the REST call. You plug in the URI and some credentials and vRealize Operations will try a PUT and POST against that URI. By the way, it will append the alert ID onto the end of the URI. This means is that unless your REST API is expecting the request in the way vR Ops would like to send it – it will fail. As you can see, Orchestrator expects a body for this request that includes any inputs. Orchestrator expects this payload even if there are no inputs. My vRealize Operations REST call to Orchestrator will fail because it is not making a valid request. How can we fix this? Webhook Shims enables self-healing with vRealize Operations through an Orchestrator shim. 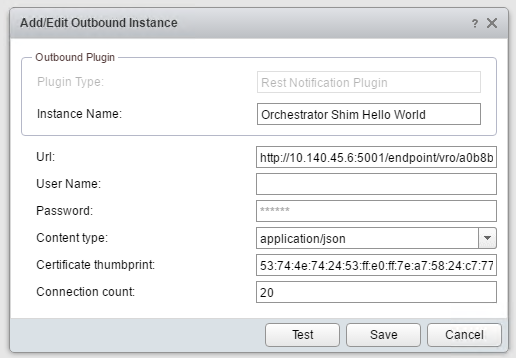 The Orchestrator shim takes the simplistic input from vR Ops REST notification and rebuilds the request in the format expected by Orchestrator. In the next blog post, I will show you how to implement this solution to automatically attempt remediation based on alert notifications from vRealize Operations to create your own self-healing datacenter!